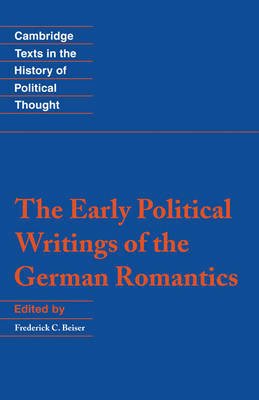 The Early Political Writings of the German Romantics contains all the essential political writings of Friedrich Schlegel, Schleiermacher and Novalis during the formative period of romantic thought (1797 to 1803). While the political thought of the German romantics has been generally recognised as important, it has been little studied, and most of the texts have been until now unavailable in English. The early romantics had an ambition still relevant to contemporary political thought: how to find a middle path between conservatism and liberalism, between an ethic of community and the freedom of the individual. Frederick C. Beiser's edition comprises all kinds of texts relevant for understanding the political ideas of the early romantic circles in Berlin and Jena - essays, lectures, aphorisms, chapters from books, and jottings from notebooks. All have been translated anew, many for the first time.